The cobbler dish..., originally uploaded by academy252. While I was home we dug this out of the cabinet. 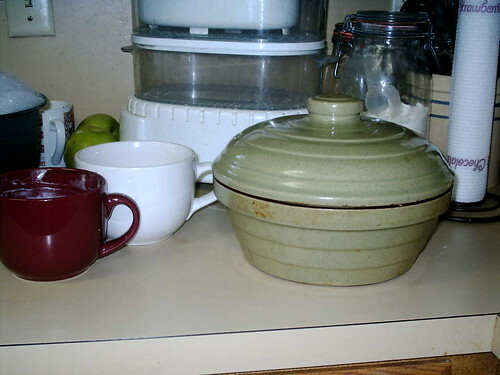 I have laid claim to this precious stoneware when my mom is done with it. It sat for many years in the kitche of my beloved Meemaw. You see, so much of what I do in the kitchen is about preserving the memories I have of sitting on a little bright red diner bench and table in the kitchen of my Meemaw while she would make such wonderful concoctions. I enjoyed homemade buttermilk biscuits, a big steaming bowl of freshly hulled and cooked peas with little chunks of bacon floating in it. I had so many wonderful things from her kitchen including a peanut butter and homemade plum jelly sandwich with a serving of Fritos corn chips and a glass 8 ounce bottle of Coca Cola while catching her daily Soap Operas with her before she had to dash off to work in the local hospital as a nurses aid. I have since let go of the soaps for better things but the memories of those foods and now trying to replicate them are a real treasure for me. This particular cookware was the home to many desserts over the years. One such dessert was the recipe I shared with you below. After my Meemaw passed away in 1988, my Pawpaw took over the responsibility of baking that cobbler for my family each week when he would come for Sunday dinner. I reintroduced it to the cobbler recipe this week and cobbler never tasted so good. Yes, this little bit of stoneware is much more than meets the eye. It is pure gold in my book!! !